Published by Joshua Clare-Flagg on 17 May, 2013. 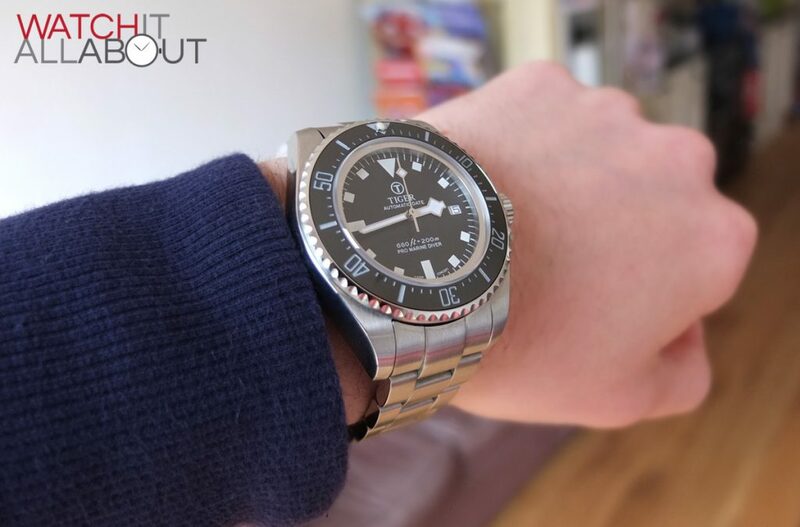 Firstly, you are met with the lovely matt black dial. It has text printed on it in a very similar fashion and positioning to the DSSD. 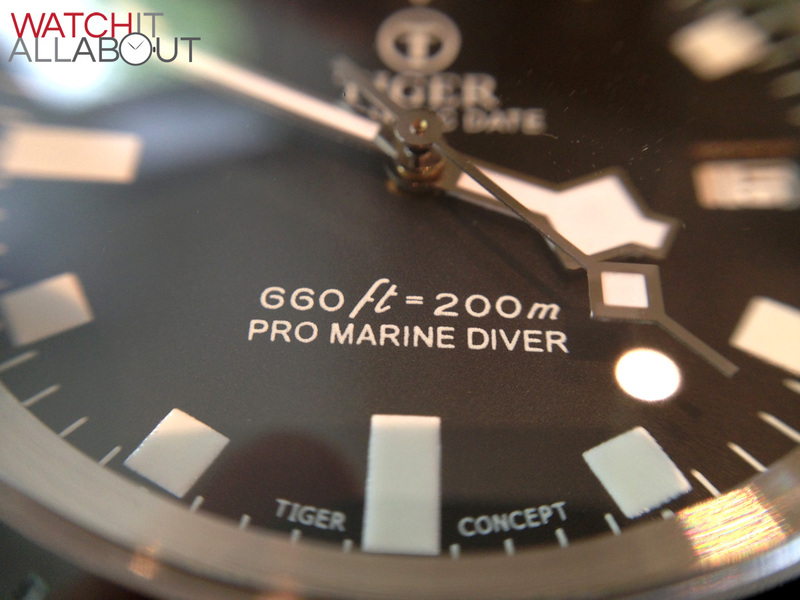 The logo of a T within a circle, with “Tiger” and “automatic date” underneath it in the top half, and “660ft = 200m” and “pro marine diver” in the bottom half. 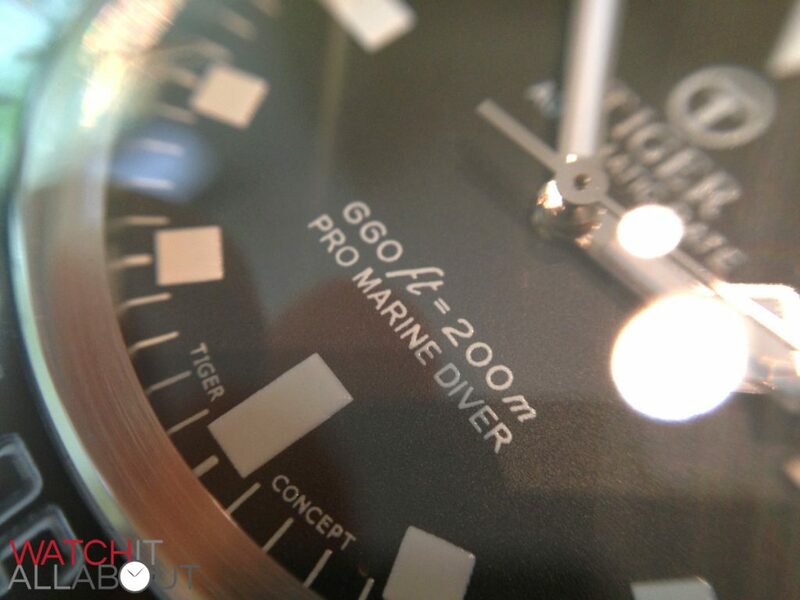 Where the usual Swiss Made is, there is “Tiger Concept” in its place. 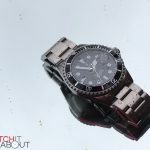 I can imagine their reasoning behind this: “It’s a good idea to put something there, even if it is rather small, as watches with writing right at the bottom always seem to be good quality.” I agree. 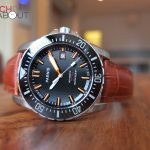 It’s not a case of snobbery, bit rather intrigue – I always look at watches to see what’s in the bottom, whether it be Swiss Made, Made in Germany, or Japan and some long number as the Seikos do. So the Tiger Concept likes to follow the trend in this regard. I simply love snowflake hands. 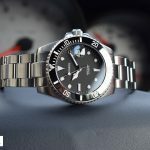 They’re just that little bit different to the usual Mercedes hands you see on pretty much every Rolex homage out there. 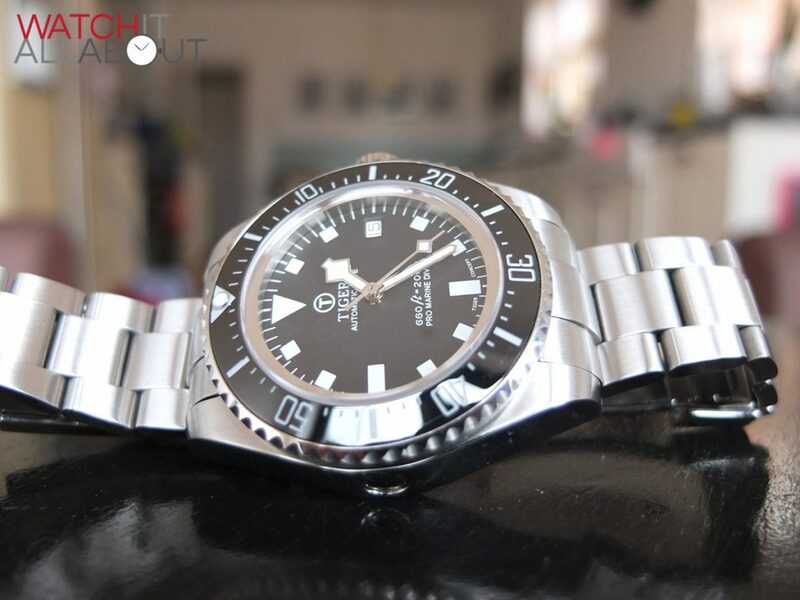 They are all very well made and flawless, with even lume distributed on them. 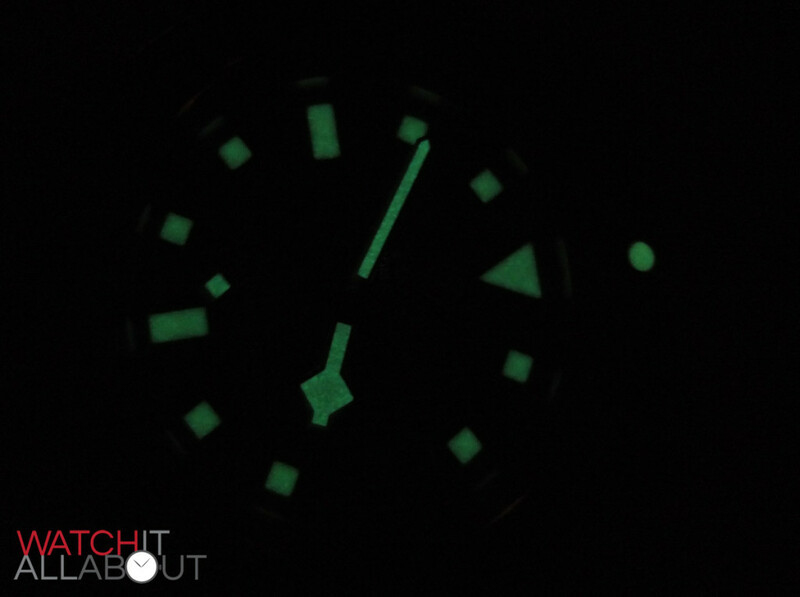 The watch has better lume than other Chinese watches like Parnis, but it is still pretty average stuff. 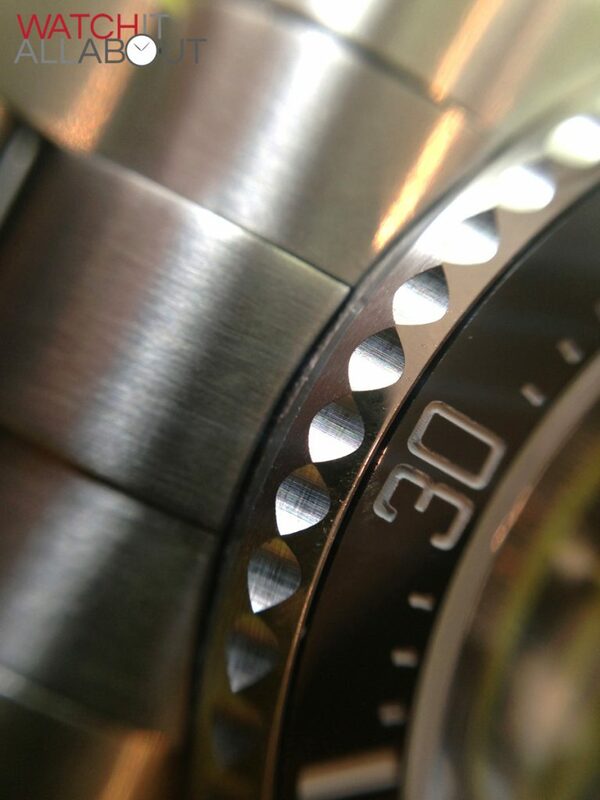 The date window is cut out of the dial – no frame here. However, the cut out is nicely done, as rather than a straight punch out, it appears to have slightly curved edges going down toward the date wheel. Hard to explain, but it give the face a little bit extra finishing about it that normally you wouldn’t expect. The date wheel is plain white with black text. It seems that the window might be slightly misaligned, as the numbers seem to be slightly too far to the right. 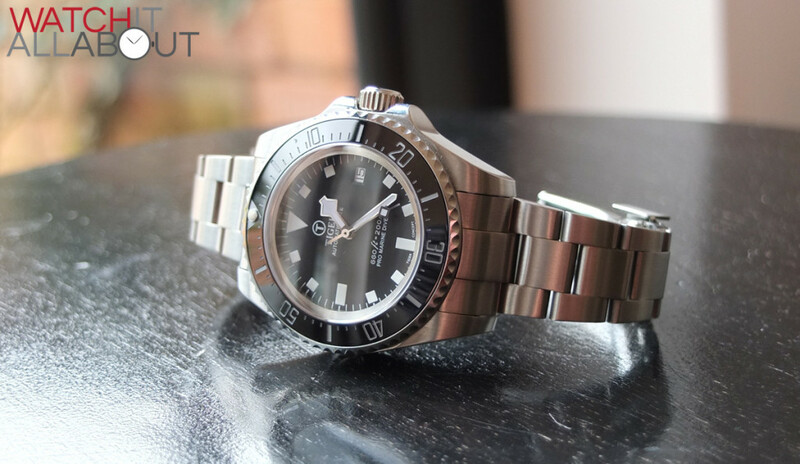 The thick steel rehaut is completely sterile – this is where “original gas escape valve” and “ring lock system” usually are on the DSSD. 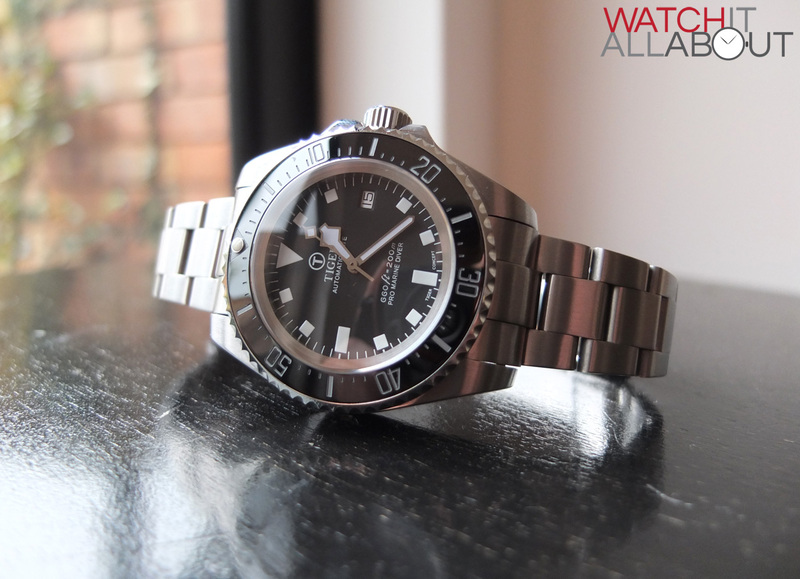 Sitting on top of the dial is a deep domed sapphire crystal which sits just above the bezel. 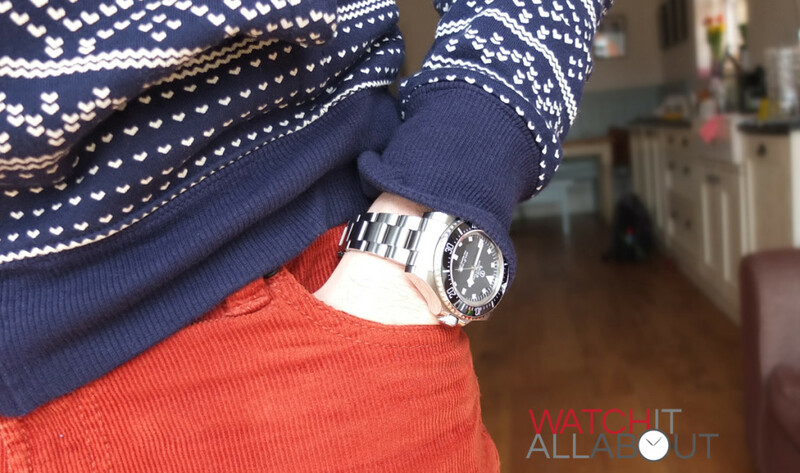 The case of this watch is massively chunky – it sits very tall! 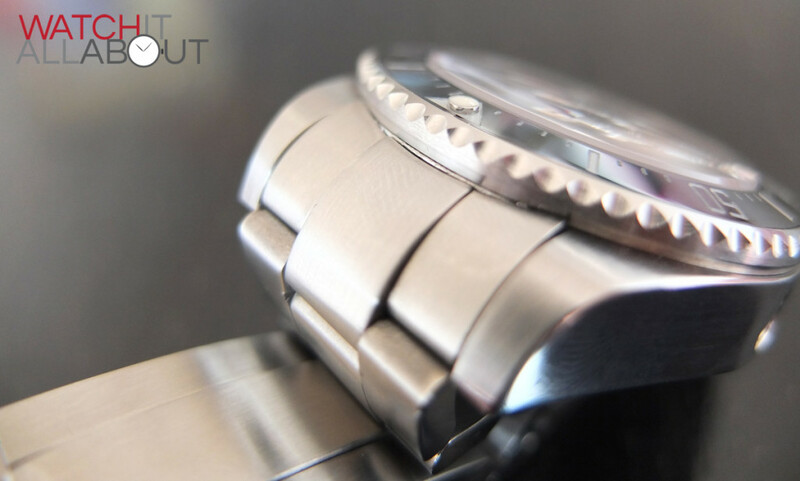 It is brushed on the top and bottom, and polished on both sides. The dimensions are 43mm diameter exc crown, and 48mm including crown – so it really is a beast. The sterile screw in case back has a nice matt feel to it. Not sure of the exact finish of it though, but it looks good and feels high quality to touch. It is a shame that it is sterile, but I am assuming that Tiger are getting the whole sterile case from elsewhere – it is most probably the same case as the sterile Parnis DSSD homage. It also has a sterile crown. It is very hard to screw up! It could be the thick grommet fitted to ensure water tightness (always good to see!). It is pretty big though, so you can get plenty of grip on it. On the side is a large helium release valve. Whether this works or not, in not too sure. It does depress however when you poke it. 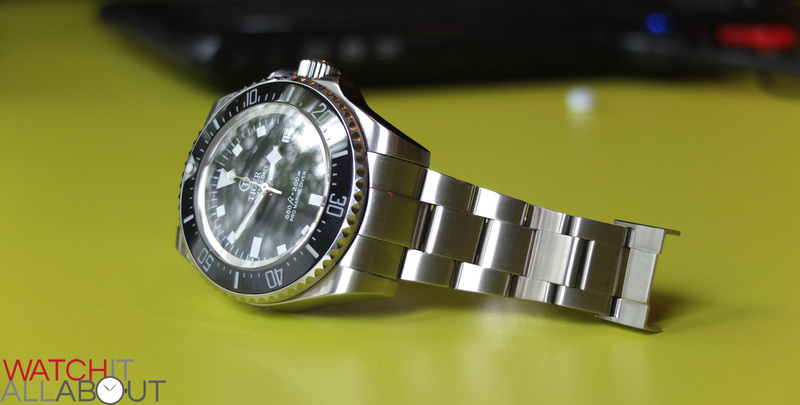 The case in general is very well finished, and for the money, you really are getting one real chunk of a watch! 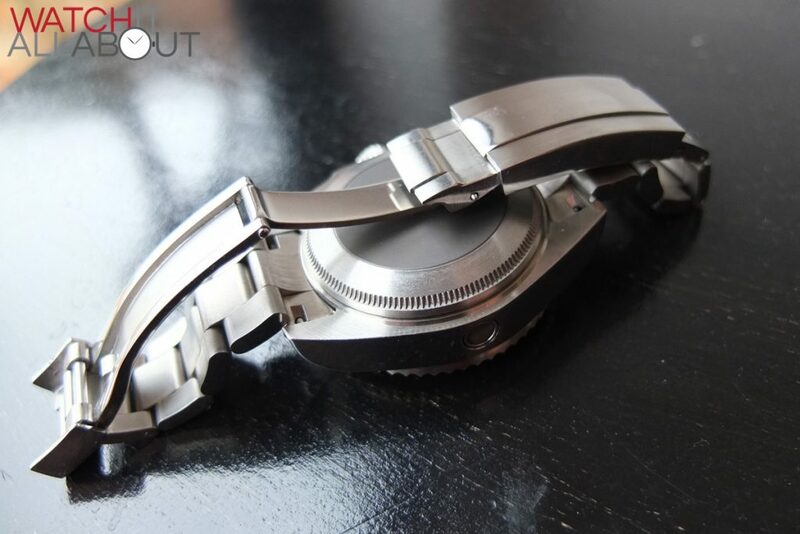 The bezel has a ceramic insert. The numbers and minute markers are engraved in and are very well done, but not completely flawless. 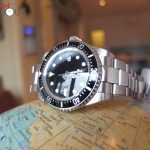 It is very similar to the Parnis 200m diver I reviewed before. 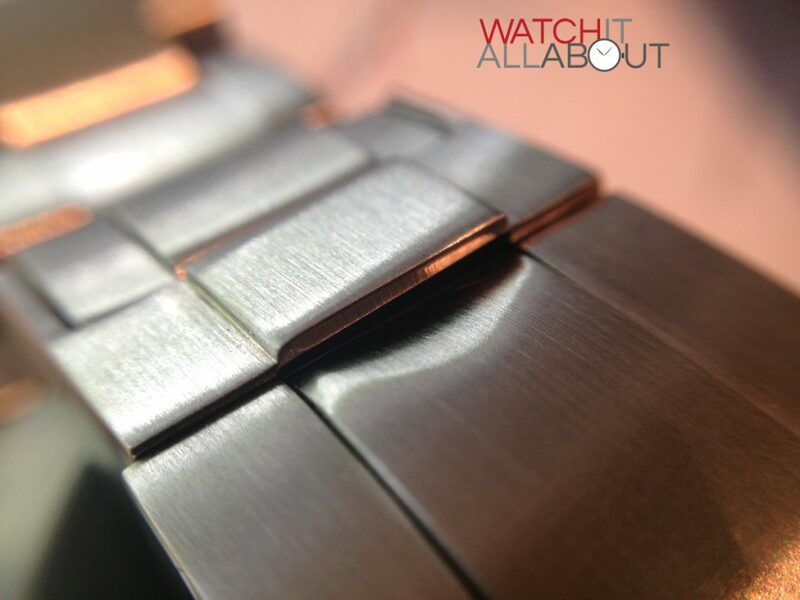 Unfortunately there is a very slight mark/scratch on the bezel that got through QC. 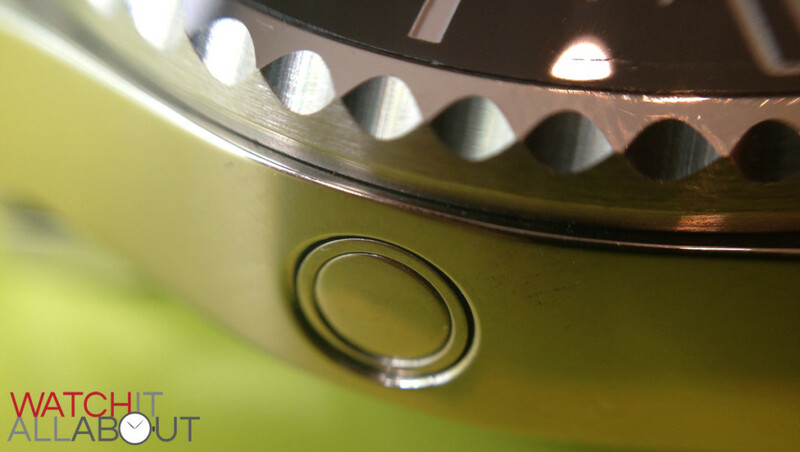 There is a bit of play on the movement of the bezel in between clicks, and it is also quite loose and easy to spin. I have already managed to move its position slightly just by wearing it normally. The edging is quite sharp. 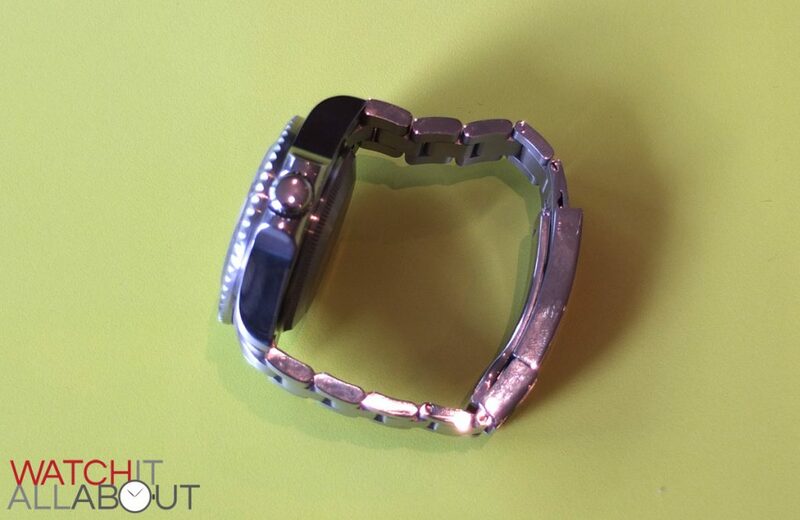 The stainless steel bracelet is easy to resize thanks to the screw-in pins. The end links don’t fit too great- as in they have a bit of movement in then, if you wiggle them you can see a slight gap appear at the top. However, they are thick and solid steel. The buckle is fantastic. It really is a wonderful piece of machining and engineering at this price point. It has an extremely easy quick adjustment, where you lift up the centre link of the top of the clasp, which unlocks the micro adjustment. 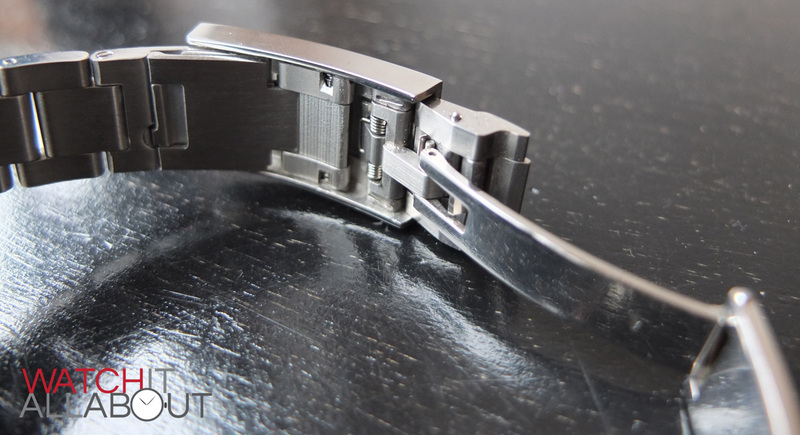 You then slide the end of the bracelet on or out to make the bracelet fit perfectly. 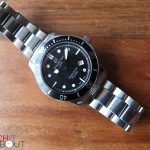 I am very impressed by this, I haven’t seen this on any other watches like this and at the price before. 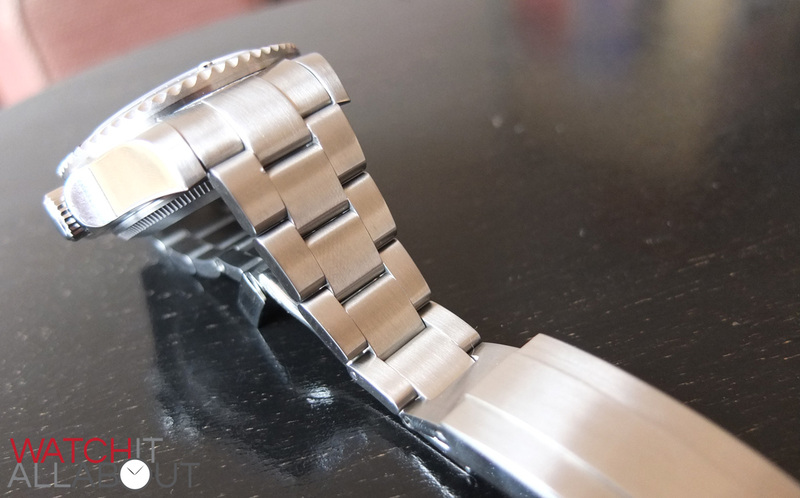 The whole bracelet is brushed steel and the links are very well machined and well made. 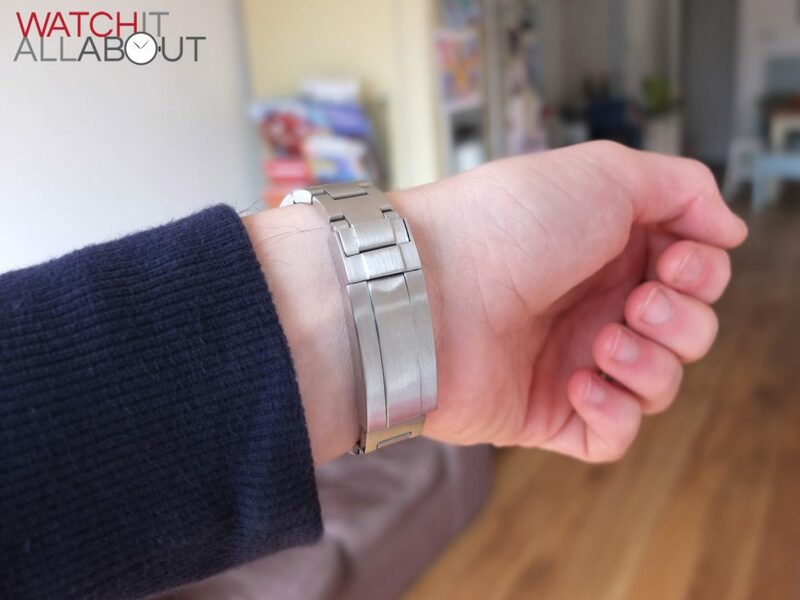 As you can see, the while of this watch is ridiculously chunky and heavy- and the bracelet is no exception. 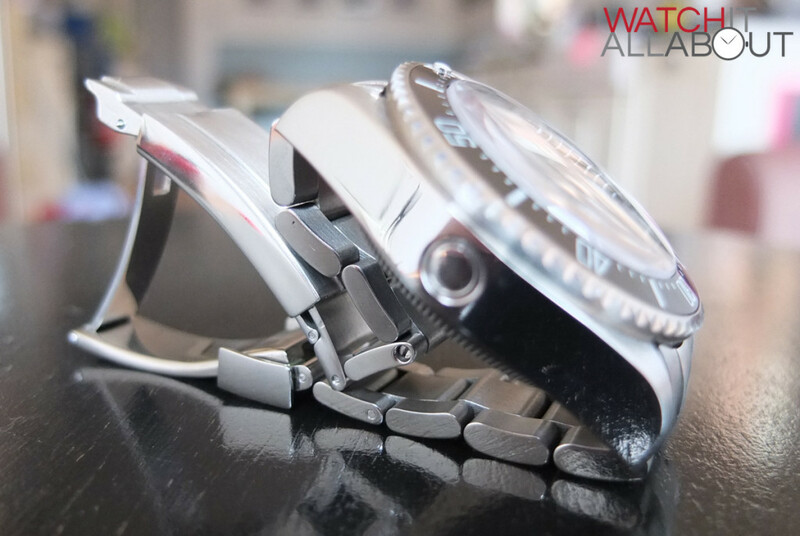 It is very comfy on the wrist, and it does a great job of balancing against the huge weight of the watch head. 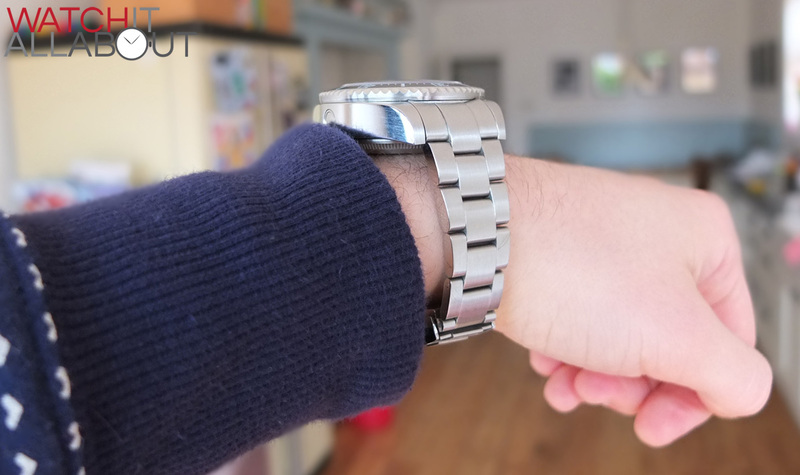 It has yet to slip around my wrist (which I was honestly expecting – this thing is huge). 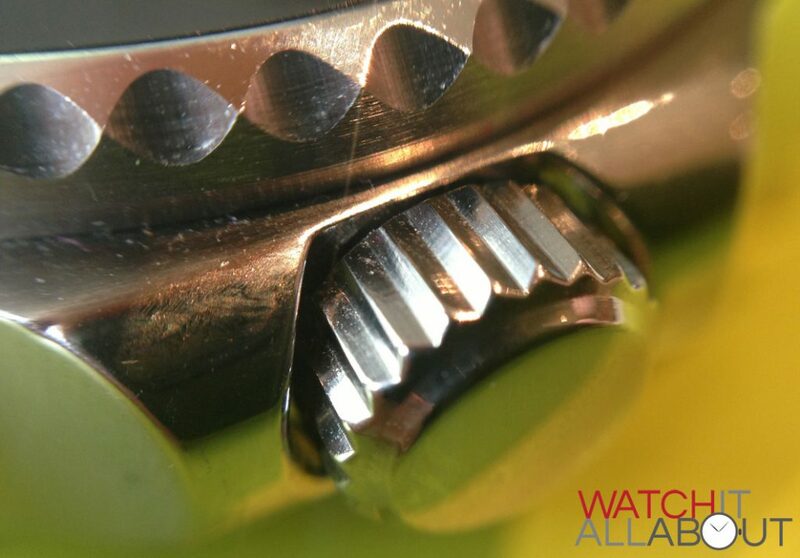 The movement is an Asian clone of the ETA 2836-2 movement. It runs at 28.8k bph. Here is no stutter on the seconds hand at all, and when you are manually winding and adjusting the time and date it feels solid and reliable. Sometimes I find that when I am adjusting the time on a cheaper Chinese movement I dont trust, it feels flimsy – as if the stem is going to break off in your hand. Not with this movement though. It feels nice and solid and dependable. The rotor is very quiet when winding itself too. 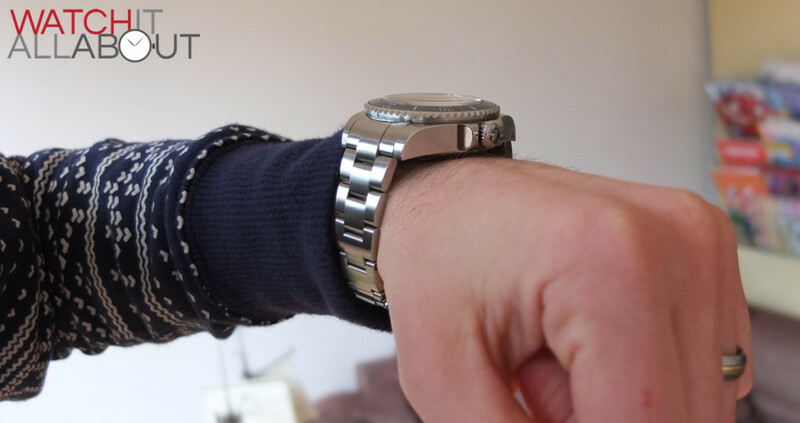 The accuracy is proving to be pretty good – around 10 seconds a day out. Hopefully this will settle down even more after time. 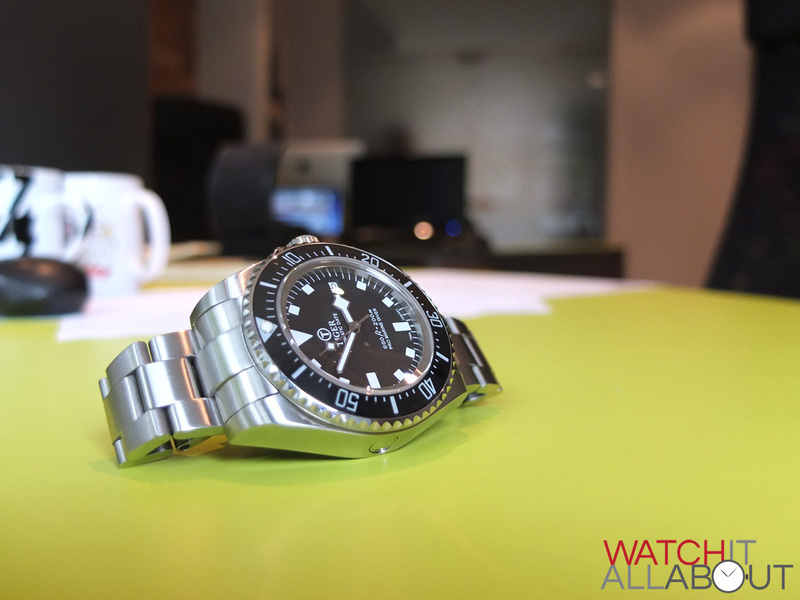 This really is a LOT of watch for the money. I understand that this may not be everybody’s cup of tea, but if it floats your boat – I would highly recommend it. 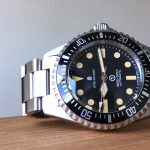 You have to like the Submariner / Deep-Sea Sea Dweller style, and like HUGE and heavy divers watches. 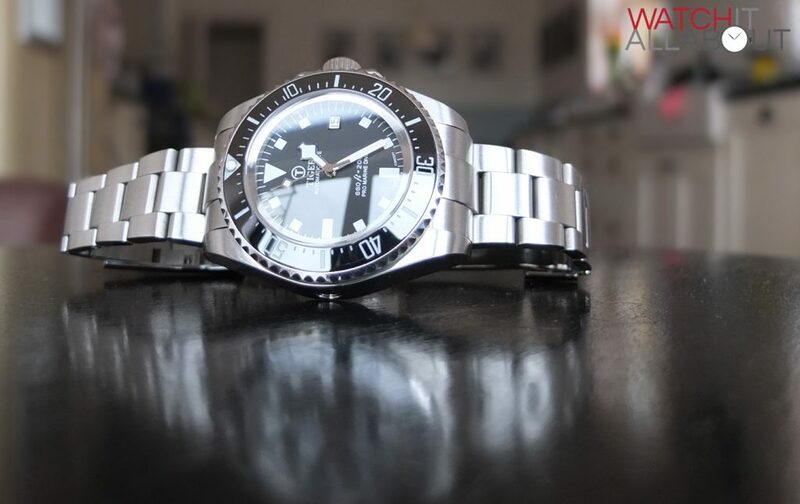 It really is an impressive watch for the money, this one in particular being $199 for Sapphire crystal, ceramic bezel, and 28.8k bph movement. You can go cheaper, if you are willing to go for a lower beat movement. I am definitely going to try out some of the other offerings from Tiger Concept. It arrived in impressive time considering it came from Hong Kong. It was very well wrapped and came in a plain plastic box with a pillow inside. Not very special, but it was well wrapped so as to avoid any damage in transit. I hope this review has been of help to others! 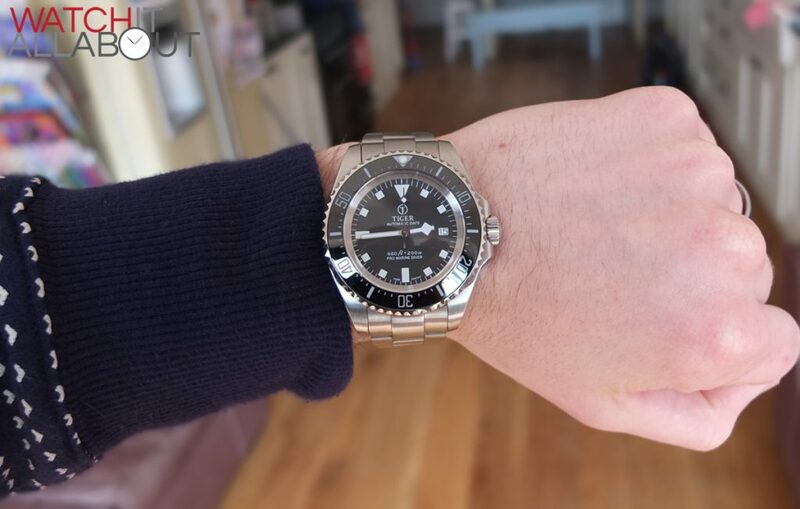 Where can I buy that band for my watch. Hi, if you email them at sales@tiger-concept.com or post on their Facebook wall (https://www.facebook.com/pages/Tiger-Concept/188823451185835) I’m sure they’ll sell you the bracelet on its own. 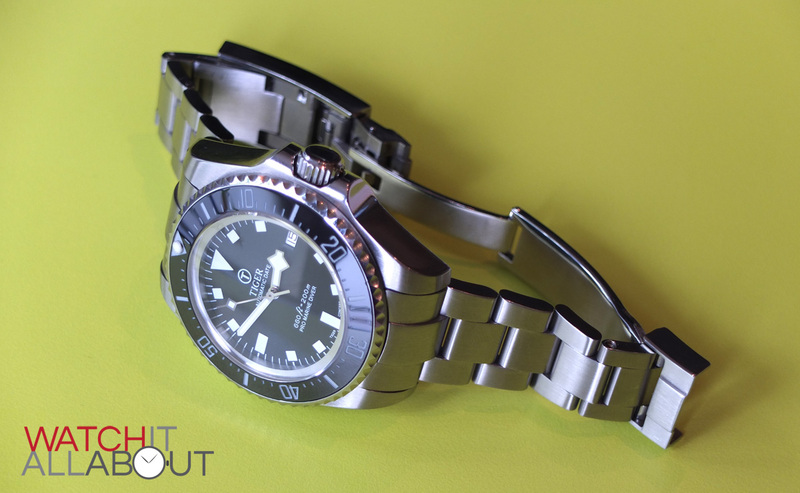 Isn’t it more of a homage to the Tudor Pelagos?